NEW YORK McDonald's (MCD) new Fish McBites failed to hook enough diners to get the fast-food chain's U.S. sales growing in February. The world's biggest hamburger chain said Friday that a key sales figure was down 3.3 percent in the U.S. for the month. When excluding the extra day of sales for February of last year, which was a leap year, the company said the figure was flat. That was despite the rollout of the Fish McBites nuggets in three sizes, which were also offered as the first new Happy Meal entree in a decade. The struggle to grow at home reflects the mounting pressures on McDonald's, which had managed to pull away from its rivals and thrive even during the Great Recession. Now the Oak Brook, Ill.-based chain is facing a rapidly shifting industry, with chains such as Chipotle and Panera reshaping customers' expectations about fast food. An increase in payroll taxes that took effect in January isn't helping. Long-time competitors such as Burger King, Taco Bell and Wendy's are also revamping their menus and stepping up advertising. Making matters worse, McDonald's CEO Don Thompson, who took the helm this summer, has said that he expects overall growth in the industry will continue to be flat to down for some time. In response, McDonald's is playing up its Dollar Menu to attract budget-conscious diners, a strategy some analysts have questioned because it could hurt profit margins. The chain is also increasing its limited-time offers as a way to keep its menu fresh. Notably, McDonald's also has a high bar to meet because of its past success; U.S. sales rose 11.1 percent in February of last year and 2.7 percent in 2011. In light of those tough comparisons, R.W. 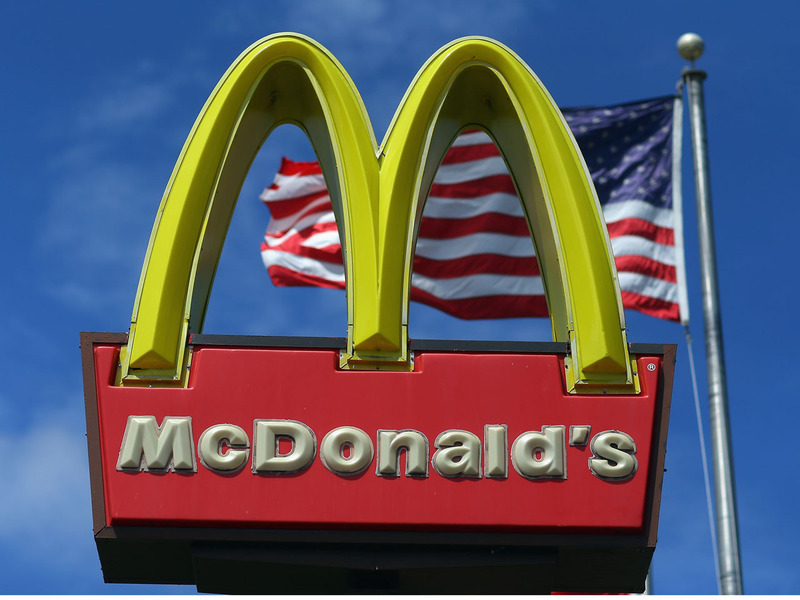 Baird analyst David Tarantino said McDonald's U.S. results were "respectable." He also noted that the broader industry remains pressured by other factors, such as higher payroll taxes and gas prices. Results in other parts of the world were mixed. Globally, McDonald's said sales at established restaurants fell 1.5 percent for the month. When excluding the impact of the extra day, the company said sales rose 1.7 percent. Over in Europe, McDonald's said sales were down 0.5 percent or up 2.7 percent when factoring out the extra day from a year ago. The company has been focusing on expanding its breakfast menu and restaurant hours throughout the region, which represents its biggest market by sales. In the region including Asia Pacific, the Middle East and Africa, the sales figure was down 1.6 percent, or up 1.5 percent when excluding the impact of the calendar shift. Although sales in China and Australia were positive, McDonald's continued to struggle in Japan, where sank 12 percent at restaurants open at least 13 months. That was following a 17 percent drop in January. The figure is a key metric because it strips out the effects of newly opened and closed locations. McDonald's Corp. hadn't logged a monthly decline in its global sales figure for nearly a decade until this past October. And the figure dropped in January as well, making February the third decline in just five months. In a statement Friday, CEO Thompson said he was confident McDonald's had the experience to "grow the business for the long term." The monthly sales figures are a snapshot of money spent on food at both company-owned and franchised restaurants and do not reflect corporate revenue.